Pre-made lentivirus express GFP fluorescent reporter under a full sequence of human EGR1 promoter, for detecting EGR1-Promoter regulated signaling pathway activity. This lentivirus also constantly express the RFP fluorescent marker under the constitutive RSV promoter. See Product Manual for details (.pdf). See Product Manual for details (.pdf). If desired, you can also use a pathway “Control Lentivirus” to establish the No-response control profile to your pathway stimulus. The corresponding pathway control lentivirus is: CAT#: Path-Ctr1. This is concentrated lentivirus provided in PBS solution, used for hard-to-transduced cell types or for serum-free cell culture. 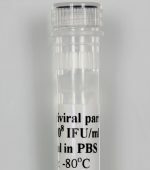 Amount: 20ul/per vial, at 1 x 108 IFU/ml in PBS.